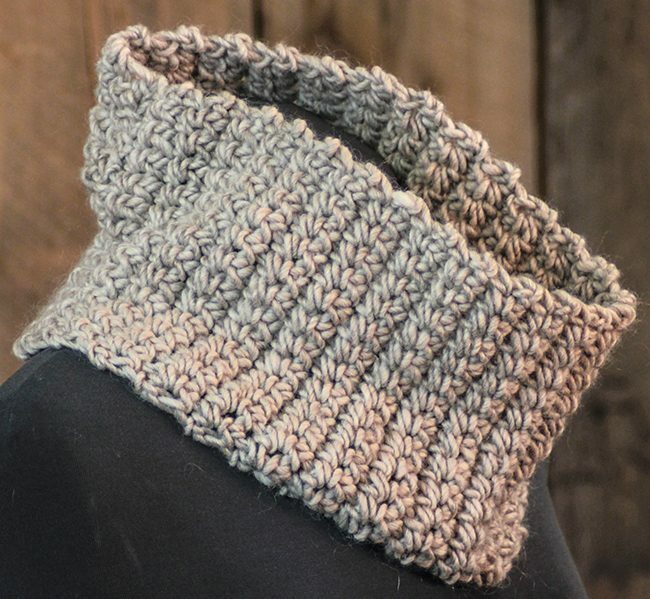 The Easy Crochet Cowl, learn as you go and love what you make! Often overlooked, crochet is another fun way to use yarn (among other things) to create… well, just about anything! From cute, playful amigurumi (like in The Big Book of Little Amigurumi and [Sorry, item discontinued or temporarily out of stock] ) to awesome rugs, clothing, accessories and housewares, crochet is as versatile as knitting. I am a HUGE fan of 70’s inspired crochet, like the projects in [Sorry, item discontinued or temporarily out of stock] . I haven’t been crocheting as long or as much as I’ve knit, but I always enjoy it when I do. I find it to be much more linear and easy to follow than knitting (but that’s just me, and how my own brain works), and the work seems to go by a little faster. But the fabric you create is very different from knitted fabric. It tends to be denser and has a little less drape to it. I think it’s best when used thoughtfully; some of the most striking handmade pieces I’ve ever seen have been crocheted. But what about learning how to do it? The internet has loads of resources for crochet tutorials, and it’s always easy to type a term you don’t understand into a search engine. Just be sure to include the word crochet! There are also a lot of great books available on the subject, such as How to Crochet. This deceptively thin book contains everything you’ll need to know to get started, and way beyond. A great reference for beginners, I always like to keep books like this on hand. In the interest of encouraging folks to start learning some new skills, I wrote up a very simple, very easy pattern for the most beginner of beginners, Easy: Learn to Crochet Cowl Pattern Download. To make this cowl, you’ll need one skein of Lamb&apos;s Pride Bulky Yarn and one size P crochet hook, like this [Sorry, item discontinued or temporarily out of stock] , which we are featuring especially for this project. Oh, and a tapestry/yarn needle, like these Large-eyed Tapestry Needles (Susan Bates) Sz 13. Please feel free to add the pattern to your order if you’re buying the yarn – or to download the pattern right now for free here!